I don't like horror books. And generally my policy is to only review kids books that I liked - there's only time for so many reviews and why waste them. But rules were made to be broken, right? So here is my review of Eerie, a new series published by Penguin Books Australia and written by S.Carey (so, given that when you read out the authors name it sounds like scary I'm guessing it is a pseudonym). Eerie is a series of very short, reasonably scary novellas. 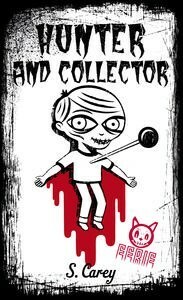 I read Game Over and Hunter and Collector. They're not my kind of thing but they are a clever series and there are definitely kids out there who would love them. The Eerie books (which have the tag line 'because Goosebumps are for chickens') are only 60ish pages long and are a super quick and easy read. They're definitely on the scary end of creepy, and kids who love things that are a bit dark will lap them up! Thirteen books will be published this year (yep, somewhere out there a publisher has an amusing sense of humour) and more are on their way.